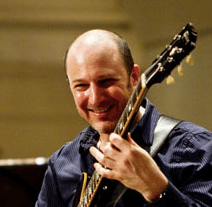 Staff arranger Russ Spiegel is a commissioned composer and arranger as well as a guitarist, bandleader, writer, producer, and actor. He received his Bachelor’s Degree at the University of Michigan, majoring in Philosophy, studied Composition, Arranging and Guitar Performance at the Berklee College of Music in Boston on a scholarship, and went on to get his Masters degree in Jazz Performance at the City College of New York, under the aegis of world-renowned bassist, composer and educator John Pattitucci. Starting fall of 2013 Russ plans on commencing work on his doctorate in Jazz Performance. Originally from Santa Monica, California, Russ relocated to Europe with his family as a teenager, spending close to twenty years in Germany where, after his studies, he concentrated on a career as a jazz musician. Russ returned to the United States in 2001, settling in New York City where his work as a musician has continued to flourish. Alongside composing and arranging, Russ has continued to busy himself with a variety of projects. Playing everything from solo jazz guitar to running The Russ Spiegel Jazz Orchestra, a 20-piece big band featuring his own compositions and arrangements, Russ has released several CDs, written music for film, TV and musicals, toured Europe and Asia, taught college-level courses, run workshops and seminars, worked as a music copyist for Broadway shows and major-label recordings as well as having appeared in a number of feature films and television shows as both a musician and actor.